By some twist of fate, the far eastern section of the Roman city wall, running in a straight line all most due north from the Tower of London to Aldgate, contains some of the best preserved, and importantly visible sections of the wall. The large sections by Tower Hill and Cooper's Row are the most easily viewed, (see Green push-pins on map) being accessible above ground and in public spaces. However, always up for a challenge, I have been trying to discover and get access to visit all the remains of the Roman wall that are now preserved with private buildings along this eastern section (see Red push-pins on map), of which there are a good few. All you need is the time, patience and a bit of courtesy to winkle your way into these buildings, and enter a world of hidden cellars and forgotten basements hosting these magnificent monuments. I have posted earlier articles on my visits to these hidden sections of the wall. Please refer to Part 1, Part 2 and Part 3 of this series using these links or the navigation panel at the side. 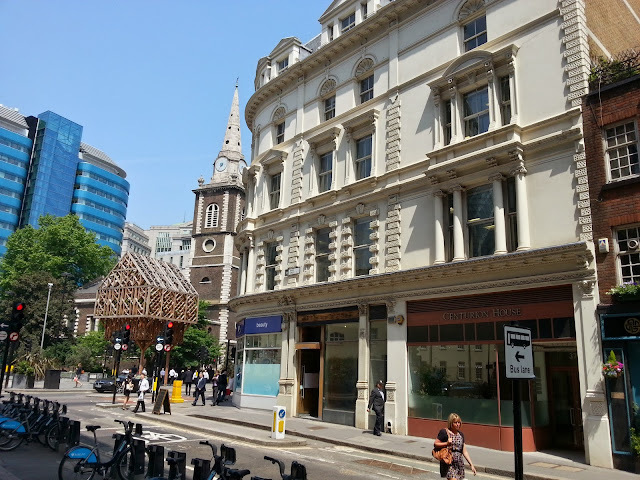 This post features Henessey's Bar, formally The Three Tuns public house, which is located at the northern end, and eastern side, of Jewry Street, close to the location of the Roman gateway of Aldgate. There has been a pub on this site since the early 18th century, with map records showing a pub on here in 1747. The present building though is 20th century, having been rebuilt to it's present form in 1939. 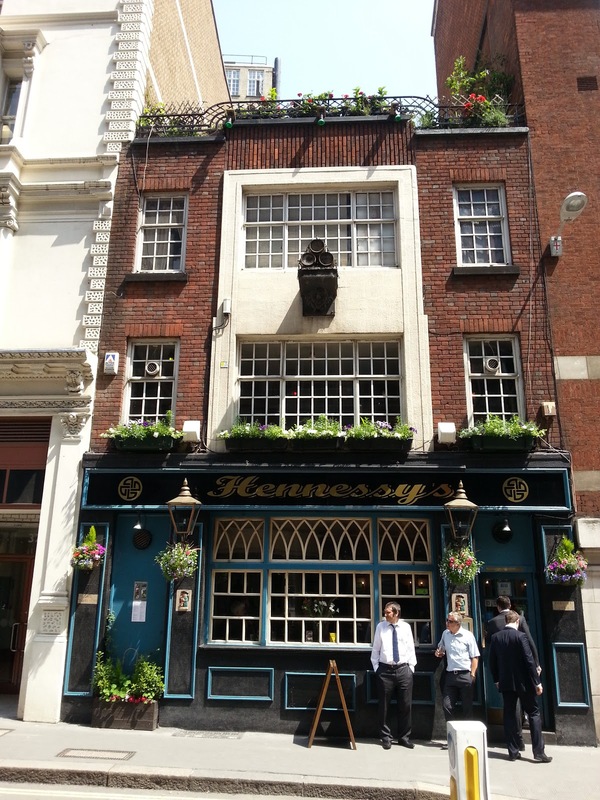 There are several connections with the notorious Jack the Ripper and this pub, with the possibility that the "Ripper" may have hidden in the pub's cellar to escape police on several occasions by using the cellar flap and chute at the rear of the building, accessed from the dead-end of Vine Street. The full story can be found on Hennessy's web site. The line of the Roman wall here is right under the front walls of the properties on the eastern side of Jewry street, which include the Sir John Cass foundation, Hennessey's Bar and the appropriately named Centurion House. In fact the Roman wall for this site is acting as part of the front cellar wall and foundations of the building, but has been exposed and preserved for viewing behind a large perspex panel. The hole section of wall is about 5m (17ft) in length. The sandstone plinth, marking the original Roman ground level, is visible just above the cellar floor at 2.69m (8ft 10in) below modern street level. Above the plinth are the usual four courses or ragstone, a tiled bonding course, with a further six courses of ragstone towards to top of the visible wall. 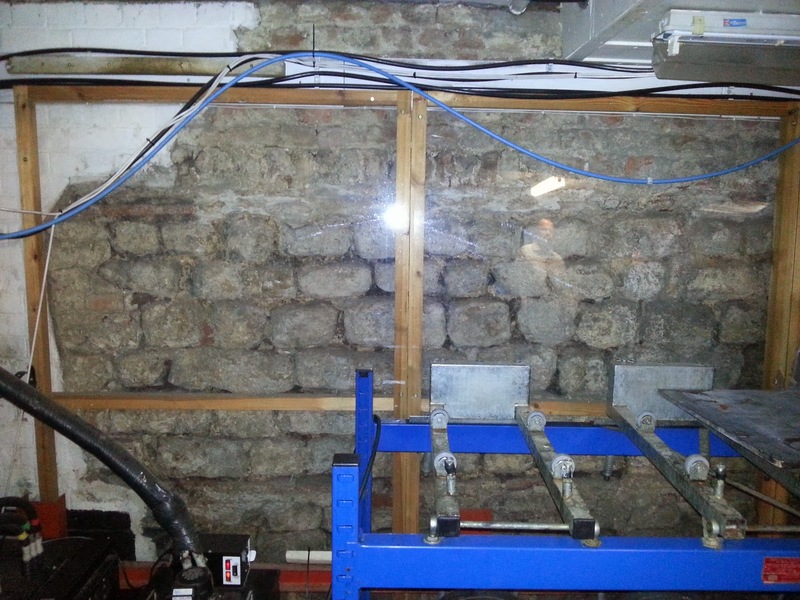 The wall is 2.39m (7ft 10in) thick above the plinth and 2.67m (8ft 9in) just above the cellar floor. This post is probably the last of my posts dealing with the eastern section of the Roman wall, as I have now to my knowledge visited all but one of the preserved sites. The last one being a small section of wall within the Sir John Cass Collage, 31 Jewry Street. I have attempted to get access to view this section, as they proudly mention it's existence on their web-site, but I have been told that it is just a view of a small cross section of the wall, behind a small glass panel about 1m (3ft) by 1.5m (4.5ft). This is located in a secure financial vault within the basement and is not available for public access. Yet! Only just found your web pages today Simon. I have indeed seen the section of Wall to which you refer in the Sir John Cass College. My wife and I were aware such a piece existed but visited on spec, on 15 Feb 2011. At that time, it was part of the London Met University (now the David Game College) and one of the doormen kindly took us there and then to the basement where the end-on piece of Wall was behind an openable 'window' in a sort of cupboard and labelled with a loose paper card saying "Portion of Roman Wall of London (in situ)". It wasn't a financial vault by any stretch of the imagination. I have some photos of it but can't see how to download them to your website.